On Thursday, NARAL Pro-Choice America released its annual report on the status of reproductive rights in the US. The report puts numbers to something you might already have guessed: in 2011, legislators around the country were quite busy passing bills limiting access to abortion services. At the national level, the House voted on eight different bills dealing with reproductive rights. That’s up from one vote in 2010, three in 2009, and zero in 2008. But state-level lawmakers were even more active. 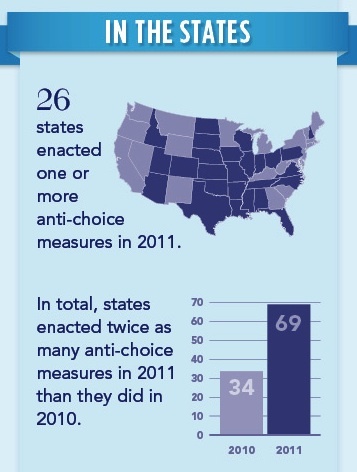 In 2011, 26 states enacted 69 new limits on abortion rights. That’s the second-highest number since NARAL started counting in 1995, coming in just below 1999, when 70 such measures were passed around the country. Over 700 anti-abortion rights measures have been passed around the US since 1995.